Looking for something to do during your stay at The Bridgeview Bed & Breakfast? How about visiting The AACA Museum in Hershey PA to see the Summer Exhibits Opening Night, May 17th, 2019, which will showcase the opening of their new exhibits, Studebaker Cool, Harley-Davidson, Pontiac-Oakland. The party starts at 6pm, and drinks and light hors d'oeuvres will be available. It will be a good time for all!! When your AACA experience is over, come back to The Bridgeview, rest your feet and enjoy the breathtaking view from our deck or sitting room. We have plenty of space for relaxation, 10 cozy rooms, each with private bath, Wifi, freshly prepared breakfasts and a comfortable atmosphere that will make you feel right at home. See what our guests have to say at Trip Advisor and visit us on the web. You can make The Bridgeview B&B your lodging destination for Central Pennsylvania by calling 717-957-2438 to book your room, and let the adventure begin!! The Middlecreek Valley Antique Association will be holding the 23rd Annual Spring Antique Machinery Show on May 17th through 19th, 2019. This show features antique tractors, gas & steam engines, truck and tractor pulls, square dancing, equipment demonstrations, flea market, craft vendors, lots of food with both free parking and admission!! Located on a former farm in Snyder County, Pennsylvania just west of Selinsgrove. Join us in our efforts to preserve agricultural artifacts and educate the public about farming and rural lifestyles. This is one very entertaining event you won't want to miss! After an enjoyable day at the Fall Show the perfect place to stay is The Bridgeview Bed and Breakfast, the most beautiful lodging destination in the Susquehanna Valley area of Central Pennsylvania. All rooms are clean and cozy with private bathrooms, A/C, Wifi, a freshly prepared breakfast, and awesome views from our decks! See what previous guests have to say at tripadvisor, visit our website for more information, and to book your enjoyable stay, call 717-957-2438 today! You do not want to miss Spring Weekend at The Grove May 16th - 19th, 2019, featuring special events, Tractor Pulls, the Annual Consignment Sale and Spring Car Show!! Plus, the Williams Grove Railroad is the only place in the world where you can see and ride behind an authentic operating Pennsylvania Railroad Steam Locomotive! Steam Engine #5, originally built by the Pennsylvania Railroad as #643 was purchased in 1961 from the Phoenix Iron and Steel Company in Harrisburg, PA. The locomotive now operates as part of the Williams Grove Historical Steam Engine Assoc. 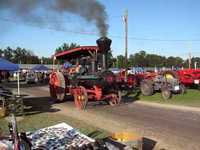 whose goal is to preserve and run historic steam powered equipment. In addition to the train ride don't forget to check out The Farmer's Flea Market. If you enjoy trains, then you will love The Bridgeview Bed & Breakfast located in Marysville PA. Our spacious decks give you the perfect view of Rockville Bridge and trains making their way in and out of Enola Yard. It's a train lover's paradise! Take a virtual tour on our website and view guest references at Trip Advisor. We have clean comfortable rooms with private baths, Wifi, a tasty breakfast, and an amazing view! To make The Bridgeview B&B your lodging choice while visiting Williams Grove or anyplace in Central Pennsylvania call 717-957-2438. Come see why our guests can't wait to come back! Kristy's Whistle Stop is open for the Season!!!!!!!!!!! WooHoo! It's that time of year again! Kristy's Whistle Stop is now open for the season on Thursdays, Fridays, Saturdays and Sundays. Offering fun for the whole family, Kristy's is a 50's style Restaurant with plenty of food, drinks & ice cream flavors to choose from. Everything is delicious and the atmosphere is friendly! There's no better place in the area to enjoy ice cream and treats! Just like at the Bridgeview Bed & Breakfast where you can enjoy the River, Mountains, famous Rockville Bridge and all the wildlife surrounding us. So when visiting Central Pennsylvania particularly the Harrisburg area, be sure to stop by Kristy's and make the Bridgeview B&B your "home away from home" lodging destination. Call 717-957-2438 to book your stay! Visit us on the web and we have guest reviews at Trip Advisor .